Between the hype around the over optimization rumors, a bug delisting sites in Google and the true roll out of the webspam algorithm - over optimization - and having a baby, with a stomach bug and getting fever a few days later (I am currently home sick which is rare for me) - I missed a Panda update! It is all in good humor, it shows that I normally do catch these things and when I miss something, Google takes notice. But why didn't Google tell me this when I kept reporting fluctuations, which I clearly said could be a bug, the over optimization or even a Panda refresh, yes I did say that. 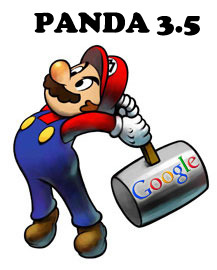 So for documentation purposes, there was a small Panda refresh, version 3.5 on April 19th, all during the pushing out of this over optimization and the huge parked domain bug. Now I will go back to sleep. Forum discussion at Twitter, Google+ and WebmasterWorld.